During mating season the male is entirely black with a faint green gloss on the body and a faint bluish or greenish gloss on the head. It may look black depending on the angle of the light. Rusty Blackbirds in winter. Feeding and singing. Connecticut. 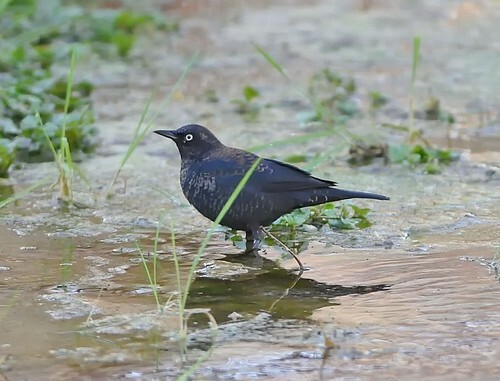 A male Rusty Blackbird singing and preening in Munson Slough south of Lake Henrietta in Tallahassee, Leon County, Florida. Rusty Blackbird (Euphagus carolinus), female, Hillsboro Public Library, Oregon, 31 Oct 2013. Found 30 Oct. by Mark Wilkinson. 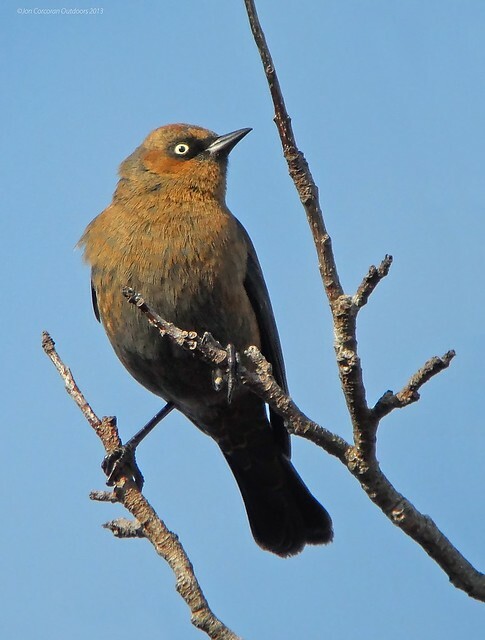 There are only 12 previous accepted records in all of Oregon for this species, which is from eastern North America and is declining at a rapid rate.